According to reports, about 400 ISIS terrorists were killed and many injured during the clashes in the area of Khanasser and along the supply road linking Hama and Aleppo. In turn, the Syrian forces have reportedly lost some 87 fighters in this area. Such difference in casualties has become possible due to the pro-government forces’ advantage in fire power, intelligence, coordination and logistics grounded of the Russian military grouping in Syria. The control off the Aleppo-Khanasser road allows the Syrian forces to continue anti-terrorist efforts in the area of Aleppo City and press the advance in the direction of Raqqa. The Syrian Democratic Forces (SDF) have reportedly captured the hilltop of Tal Musharafah in the Aleppo province. Tal Musharafah is located along the road of Al-Castillo which is used by the militant groups to resupply their fighters inside Aleppo City. Thus, Al Nusra and its allies are no more able to use this supply route. 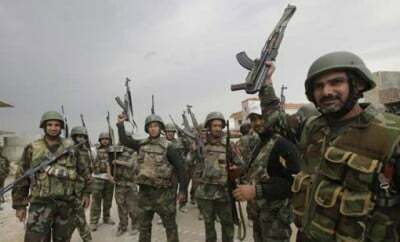 About 80 militants formerly fighting in the al-Ghadam region of the Damascus province surrendered to the Syrian government on Mar.1. The Syrian Air Force has been dropping leaflets over the militant-held part of Eastern Ghouta giving the militants a chance to lay down arms and surrender to the government forces. We remember, Syrian President Bashar al-Assad has offered amnesty and an opportunity to return to peaceful life to militants of the opposition groups who lay down the arms.